The Chinese New Year starts next month, and 2015 is the year of the Sheep/Goat/Ram. So, this is an appropriate time to do a sheep craft! We've also fed some sheep recently at a children's farm. So, there was definitely interest on Little Dude's part. We made a black and a white sheep using cotton wool, and we also practised our Baa Baa Black Sheep nursery rhyme! 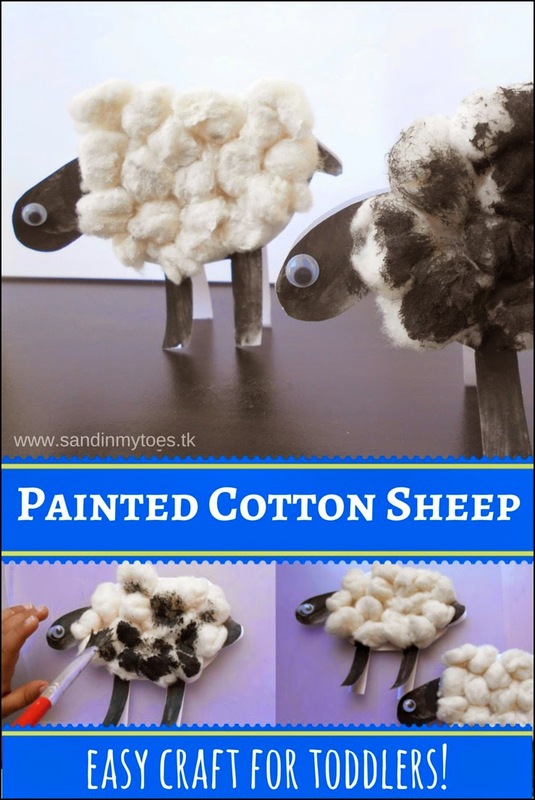 Apart from our easy painted cotton sheep, I've also shared twenty more easy sheep craft ideas below. 1. Draw an outline of two sheep on the card paper. 2. Colour the face and legs black. 3. Fold over the card in half (for the sheep to stand), and cut out the sheep outline. 4. Put some glue on the sheep's body and stick on the cotton rolled into balls (or use ready cotton balls). 5. Stick on the googly eyes. 6. Paint the two sheep white and black. 7.. Make the sheep stand as shown. And our painted sheep look great! I really wanted to make them stand, so I chose to fold over the card, but you can make them flat as well. 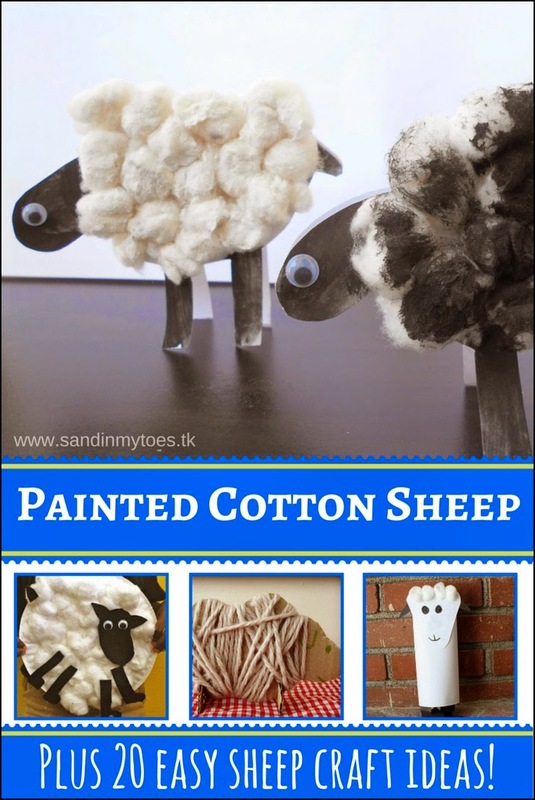 Here are twenty more fun and easy sheep crafts for you to try! Cardboard Tube Sheep by There's Just One Mommy. Pouch Cap Sheep Printing by House Of Burke. Weaved Woolly Sheep by Sun Hats and Wellie Boots. Pulled Cotton Sheep by Capri +3. Paper Plate Sheep by Kid World Citizen. 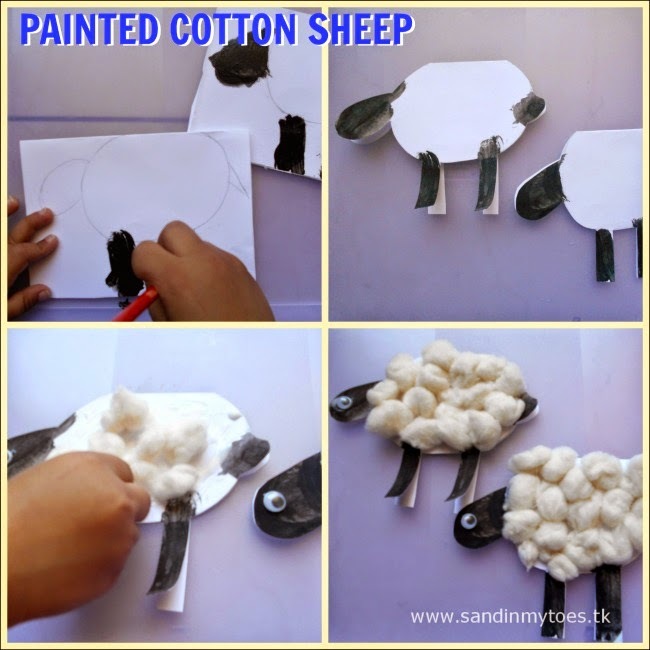 Soft Paper Plate Sheep by In The Playroom. Contact Paper Sheep by My Mundane & Miraculous Life. Sheep and Farm Animal Windsocks by Buddy and Buddy. Sponge Sheep by Multicrafting Mummy. Fingerprint Sheep by Crafty Morning. Shredded Paper Sheep by Housing A Forest. 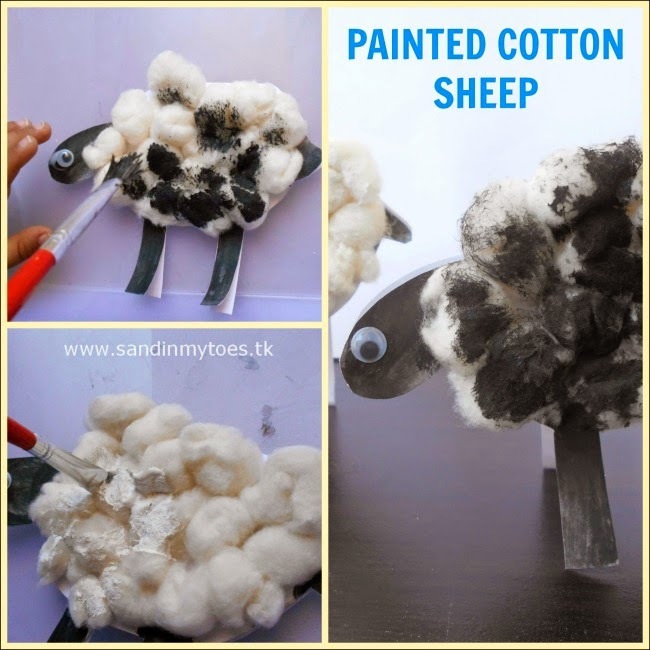 TP Roll Sheep Craft by Red Tart Art. Painted Sheep & Snack by Mama Miss. Egg Carton Sheep by Kids Play Box. Cupcake Liner Sheep by I Heart Crafty Things. Lamb and Sheep Masks by My Little 3 And Me. Sheep Ornament by I Can Teach My Child. Yarn Sheep by To The Moon and Back. Shape Sheep by JDaniel4's Mom. Those are a lot of ideas, so have fun with your sheep crafts this year! Such a cute thing to make. Thanks for sharing. Thanks for including our cardboard tube sheep! Love the sheep and what a brilliant resource list too. They look really cute and fun to make. My drawing talent is very limited too, as you can see! I'm sure she'll love it! this is a great idea - maybe take a look at my crafting prompt as i am sure you would have lots of ideas to join in with. Thanks Sarah, will have a look at your prompt too!